Singing, chanting and the playing of instruments played an integral role in Woodlands ceremonies and rituals. 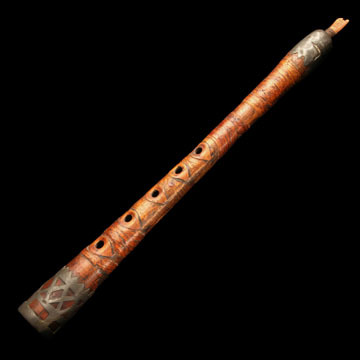 The Iroquois referred to these woodwind instruments as, Ya-o-da-was-ta or a “blow-pipe.” The use of birch and the pewter inlay is characteristic of the Northeastern tribes. The anthropologist Lewis H. Morgan wrote, “As played by the Indians, it affords a species of wild and plaintive music.” (Tooker, On Iroquois Material Culture, 1994).